The Samsung ML-3051 is a high-speed monochrome workgroup laser printer that boasts fast first page out times, quality resolution, powerful processing and high duty cycles. Upgrade options provide plenty of expandability to handle increased job demands while remaining as cost effective as possible. Paper input capacities can be doubled and network connectivity can be added, with the option to increase RAM to a maximum capacity that will easily accommodate any volume print job and any level of network resource sharing. The price is also reasonable enough to be affordable for some home and personal use. 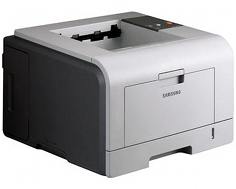 The Samsung ML-3051 can print at speeds as high as 30 pages per minute while maintaining a reasonable level of quality. The ML-3051ND can handle duplex printing at up to 21 pages per minute. First page out speed is less than 9 seconds from a ready state, reducing wait times for people who need to print on the fly, whether it be one page or multiple page documents. Print resolution for all three models is up to 1,200 x 1,200 dots per inch, providing professional quality results when printing business documents such as memos, letters, invoices and reports. A Samsung 400 MHz processor offers a significant increase in tasking power over previous models, allowing for easier integration into networks and handling of higher volume print jobs. The base model comes with a standard 16 MB of RAM, which can handle most text document printing and some graphics without delays due to printer “think” times, and is upgradeable to a maximum of 272 MB for handling network sharing. The ML-3051N and ML-3051ND come with 64 MB standard RAM that can be upgraded to 320 MB maximum, better suited for the increased networking and duplexing capabilities that come standard with these model variations. A monthly duty cycle of 35,000 pages is rated for small and medium businesses that require higher volume capabilities without compromising reliability, quality or printer life. The base model cones with a high-speed USB 2.0 interface and a parallel port, providing the option to accommodate both newer and older computer interfaces that were still being used at the time of release, with the option to purchase an external 10/100Base-TX Ethernet controller for network integration. The ML-3051N and ML-3051-ND come equipped with a built-in Ethernet controller, in addition to the USB and parallel interfaces. Operating systems supported include Windows XP and 2003 Server, as well as Mac OS 8.6 to 10.4 and some builds of Linux. Noise levels for all variations are less than 54 dBA when fully operational and less than 39 dBA when in standby/sleep mode. Power consumption for all variations is less than 400 Watts when fully operational and less than 11 Watts in power saver mode, rectifying a design flaw in previous models that caused excess power consumption when utilizing Ethernet adapter and RAM upgrades. Paper input capacity is 300 sheets, divided between a 250 sheet cassette and a 50 sheet multipurpose loading tray. An additional 250 sheet cassette can be purchased to accommodate a maximum of 550 sheets of paper at an average weight of 20 lbs. 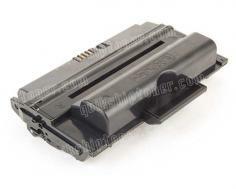 The ML-3051ND includes an automatic duplexer for printing on both sides of a sheet of paper. PostScript emulation is only available with the ML-3051N and ML-3051ND variations, making network integration with the base model more difficult and features more limited, even though the base model can be upgraded to accommodate an external Ethernet controller. Purchasing the external Ethernet adapter for the base model requires purchase of a RAM upgrade as well, since 16 MB of RAM is barely sufficient to handle sharing this printer as a network resource. As with previous models, the ML-3051 can only support Mac OS 10.3 due to the absence of the PostScript emulation language in the base model's firmware. The plastic multipurpose loading tray is not very durable, often breaking and voiding the warranty on these units if paper weights exceed 20 pounds. Review it: "Samsung ML-3051 "
The starter cartridge that ships with this printer has a standard yield capacity of 4,000 sheets. Replacement cartridges can be purchased in standard yield or high yield, which offers an average capacity of 8,000 sheets. 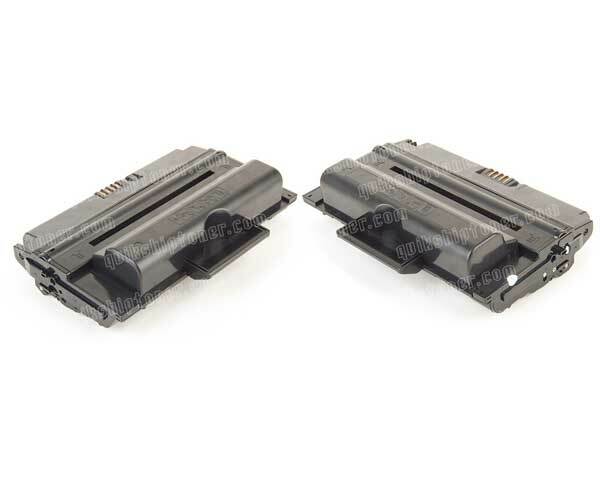 ML-3051 / ML-3051n / ML-3051nd 2pack of Toner Cartridges - 8,000 Pages Ea.